I love Judge Judy but she says some weird things. 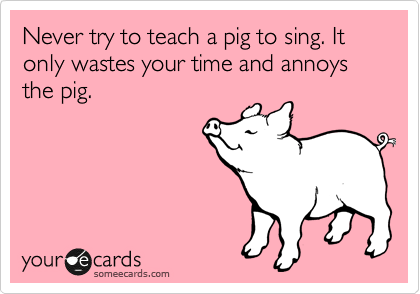 I’m not sure if anyone would even try to teach a pig to sing or not but I do imagine that it would be difficult. This statement reminded me of what many of my clients are going through when trying to hire and train staff in the United States. It’s a bit like trying to teach a pig to sign and dance. The problem lies in the part of the statement that says the pig doesn’t like it. Unfortunately the majority of the available workforce in United States also don’t want to learn how to sing. This is what has pushed me to help my clients open call centers in Jamaica. The workforce in Jamaica is much different than the current workforce available to the average collection agency in the United States in 2018. Staff at my Montego Bay call centers are ready and willing to work for much less then they staff in the United States. They are willing to learn and eager to please their employers. They are thankful to have a job and want to make sure that they do their best job they can. This is the difference in Jamaica. If you want to know more call us at 904-687-1687 or We are having an Open House here in Montego Bay, Jamaica on October 14-16th and I would like to invite you to attend. There is no cost except your airfare and lodging. You will meet my staff and be able to see their skill levels, you will attend sessions that will teach you more about the call center business here in Jamaica.